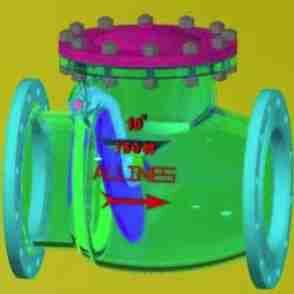 Sand Casting Swing Check Valve is used to prevent the reversal flow through pipe lines. The Sand Casting Swing Check Valve is used only for upward or horizontal flow. Moreover, the Sand Casting Swing Check Valve offers low resistance to flow and is particularly suited to low velocity services. We are a prominent Sand Casting Swing Check Valve Manufacturer, Exporter and Supplier based in India. Swing Type Disc : Disc is opened by line velocity and the resultant pressure. When the flow stops, the disc is closed by gravity. Seating load and resultant tightness are depends up on the back pressure. Outside lever and counter weight design : Objects of the lever and weight are either to balance the disc or give it added weight. Unbalancing the disc the valve will open with a minimum pressure. When the disc is weighted the valve will be sensitive to reversal of flow. Dashpot Arrangement : In case of intermittent use or in presence of thrusts, dash-pot design is highly recommended. In such instance the dash-pot design gradually causes the opening and closing of disc preventing, therefore dangerous shocks.